Nearly every day, I am inspired to hear the majority of people I meet say they love animals. I take joy in meeting every doted-over dog, cat, horse and bird in Seattle. We make it a priority to ensure our animals are safe and free from harm. We also support organizations that care for and rescue animals that would otherwise be out of our reach to save. For this reason, I am grateful for organizations that advocate for the humane treatment of farm animals, such as the Humane Society of the United States (HSUS) and similar groups. These organizations bring animal cruelty into the light of day so that we, as a community, can make positive changes in our lives and in our laws to protect all animals. Recently, HSUS exposed a slaughterhouse in New Jersey where baby calves are severely abused and beaten before they are killed. Baby calves are routinely taken from their mothers at birth so the cow’s milk can be sold to humans, and the slaughtered babies are sold as veal. HSUS also exposed a hog farm in Kentucky found to be feeding mother pigs remnants of deceased baby pigs. Seen on undercover video, all of the mother pigs were indefinitely confined to gestation crates so small that they could not walk or even turn around. This cruelty of extended confinement and forced cannibalism in our meat and dairy industry is intolerable to people who love animals. Although we are far from Kentucky or New Jersey, we can make a big difference to help animals by reducing our consumption of meat and dairy and shifting to a vegetarian diet. And, as it turns out, what is good for the animals is also good for us. “The consumption of animal products is completely unnecessary,” said Stewart Rose, vice president of the Vegetarians of Washington. A plant-based diet is highly recommended by doctors and dieticians as a powerful tool for the prevention and even reversal of many common diseases such as heart disease, high blood pressure, diabetes and several forms of cancer, Rose said. In Seattle, vegetarianism is a celebrated part of our community, and this year’s celebration begins with the 13th-annual Vegfest (www.seattlevegfest.org) at the Seattle Center’s Exhibition Hall. On March 29 and 30, carnivores, omnivores and herbivores are all invited for the biggest food-tasting event in town. More than 200 food companies will serve around 500 different kinds of delicious food, including a special tasting section for kids. “At Vegfest, you’ll discover that being healthy never tasted so good,” Rose said. 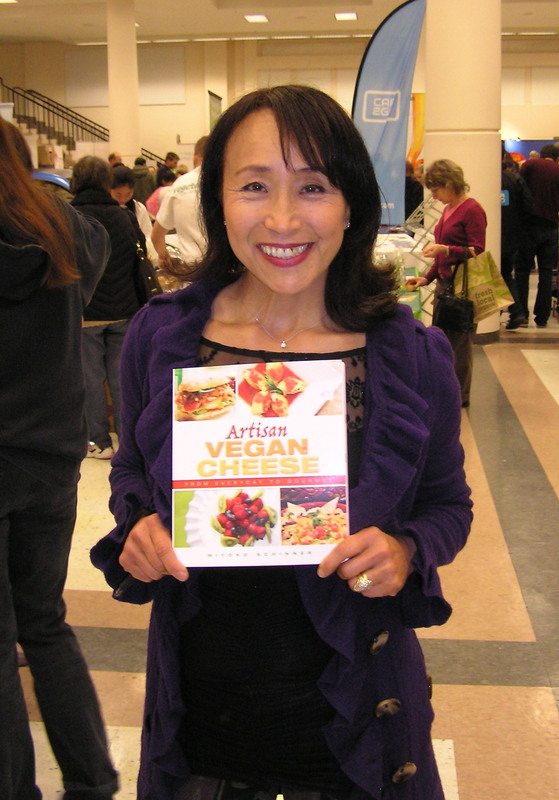 Chef Miyoko Schinner made a splash at last year’s Vegfest with her book “Artisan Vegan Cheese.” Schinner visits again this year for cooking demonstrations, alongside local chef Sunita Shastri, who will feature Indian cooking techniques. Chef Bianca Phillips joins Vegfest from Memphis to teach Northwest residents to cook vegan soul food from the Deep South. Mexican, Thai and American food cooking demos fill out the weekend and remind us that vegetarianism is a tradition from around the world. Vegfest features an expert lineup of physicians, including cardiologist Dr. Arun Kalyanasundaram from Swedish Medical Center, who will give talks on health matters. Dr. Esther Park-Hwang, a board-certified obstetrician and gynecologist, will discuss preventing common women’s health problems with the adoption of a healthy lifestyle. Several doctors will offer onsite health screenings. Our friends from the Northwest Animal Rights Network (NARN), Mercy for Animals and Fur Bearer Defenders, among others, will be at Vegfest to share messages about living more humanely. The Humane League (THL), a national organization that just opened a branch in Seattle, comes to Vegfest for the first time. THL provides outreach, including a “Team Vegan” running group and initiatives to encourage us to try Meatless Mondays. In recent years, several school districts (including Los Angles, Detroit and Oakland, Calif.) have adopted Meatless Mondays to help fight rising childhood obesity rates. The program has been suggested for Seattle Public Schools, as well. “If Seattle Public Schools went meatless for one day a week, it would save 25,000 animals per year,” said THL-Seattle director Rachel Huff-Wagenborg. Last year, Public School 244, Queens Elementary in New York began serving only vegetarian meals. Since then, school officials have reported a rise in attendance, test scores and attention spans of their students. Transitioning to plant-based meals in public schools is a growing trend. Amie Hamlin, executive director of the New York Coalition for Healthy School Food, will also be featured at Vegfest to speak on the topic. Vegfest is a family-friendly event with kids’ foods, story time, a kids’ stage and clown; admission is free to children under 12 years. Whether you are vegetarian, transitioning to plant-based foods or want to learn about better food options, Vegfest offers a celebration of a lifestyle that is good for your body, your mind and your heart that loves animals.